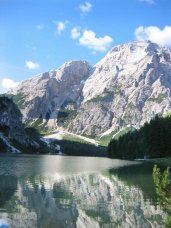 Dominated by the Croda del Becco ("Beak's Peak"; Ladinian Sass dla Porta, "Gate's Rock", German Seekofel "Lake's Peak"), silent among dark woods and austere cliffs, the lake of Braies m 1489 is one of the best known and most typical lakes of the Dolomites. It was originated by a landslide from the Sasso del Signore but is much more ancient than e.g. the lake of Alleghe, that formed in 1771. Since it is a landslide lake, it is very probable that over time the water level dropped because its threshold was eroded down (today the depth of its waters attains 37 m). Therefore the famous "gate" that gave the mountain its Ladinian name, obviously the imposing entrance of a cave that ought to have been gaping at water level, might be situated at a higher altitude than today's lake surface, and therefore buried by a not-so-huge gravel accumulation. However, retrieving it represents anyway a quite problematic caving excavation, with scarce chances of success. The mountain dominating it from due South should have assigned the lake its destiny as a sacred lake. In any case it is never directly mentioned by the Fanes' saga, except for the wagnerian final scene: trumpets blow amid the mountains, calling the Fanes to renew their kingdom; but nobody is answering, and the old queen vanishes to sleep forever on the lake bottom. Excursions: The short trip around the lake is a comfortable and very popular walk. 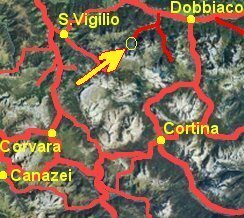 One can stretch it farther by turning West at the lake's end and continuing along the quiet val Foresta (Forest valley), that climbs mildly for long (in about 4 hs. the lake of Colli Alti, m 2252 can be reached); alternatively, one may turn slightly to the left and climb up to the alpe di Sennes plateau (Biella hut, m 2327; 3 1/2 hs. ).